20% off travel dates of April 20 - 30, 2019, bookable from April 8 - 11. Includes gourmet American Breakfast Buffet, afternoon cookies and tea, evening wine and hors d'oeuvres and Wi-Fi. Guarantee Policy: For all Reservations guarantee to a valid form of payment is required at time of booking. 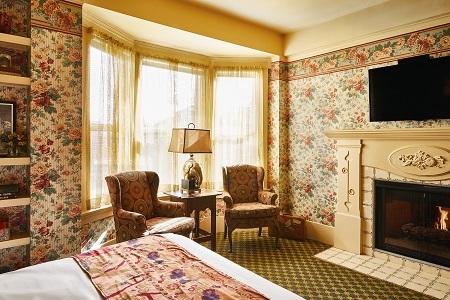 Our spacious Deluxe King with Fireplace guestrooms are large at 290 square feet. They feature tiled entry foyers, one king bed, working gas fireplaces, writing desks, 42" flat screen TVs, seating areas with a twin-sized sofa bed, bay window, in-room coffeemakers and bathrooms with shower/tub combinations. 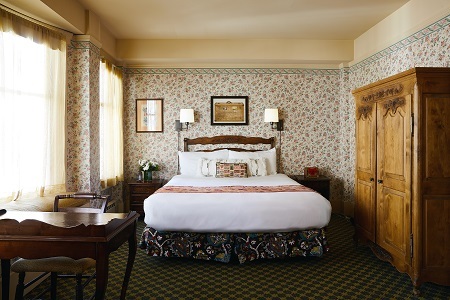 Guestroom includes a full gourmet American breakfast buffet and evening wine and hors d'oeuvres served fireside in the cozy parlor. The Petite Auberge is a smoke free hotel.